Satya Wacana Salatiga (IBL) confirmed in their roster 25-year old American guard Madarious Gibbs (185-84kg-93, college: Texas Southern). He was a team leader there last season. In 15 IBL games he had very impressive stats: 27.7ppg, 6.0rpg, 5.3apg and 1.7spg. 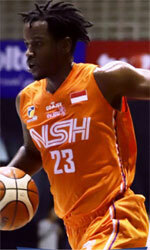 A very spectacular season in his career as he was named to Asia-Basket.com All-Indonesian IBL 2nd Team. He attended Texas Southern University until 2015 and it will be his fourth season as a professional player.